For the second year in a row I've been asked to donate a piece of art to the fundraiser Luck of The Draw which benefits the Visual Arts Center here in Richmond, VA. It's a fun event where you get your choice of unframed art for just a $100, but the trick is that you don't know who made the work (since it is signed on the back) and the order in which you get to choose a piece is based on a random selection process. If you're going to be in the Richmond area on September 23rd and you'd like an original Skull-A-Day piece at a bargain price this is your chance. And even if you don't get my art, you'll still get something great and help out a worthy organization. So what does my piece look like? Well, that would be telling, but I'm sure you can guess the subject matter! Once the event is over I'll reveal it here. Get more details or buy advance tickets for the HERE. 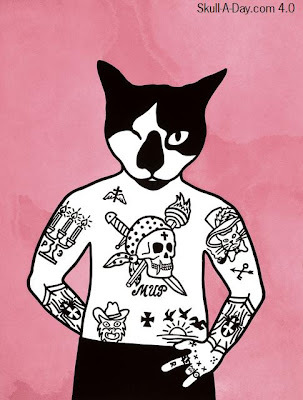 Mary Sue Muscarella of Mary Sue Tattoo, submitted three great pieces. Here is her explanation of each. 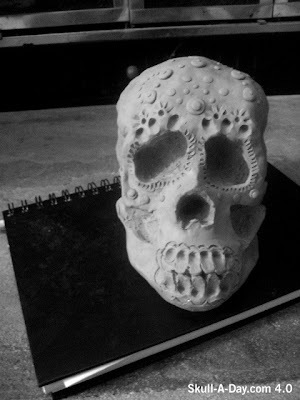 The first is a sugar skull that I sculpted out of Plastalina. The next is a charcoal drawing of a monkey skull. 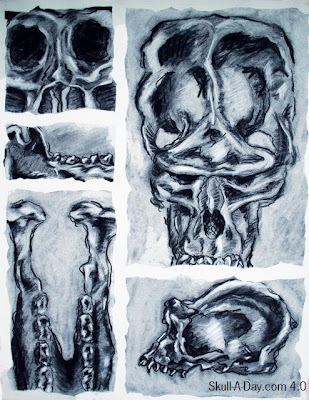 The last is a study of multiple angles of a monkey skull in charcoal. I like how each of these are different, yet incorporate the same subject, a skull. Sculptures always fascinate me, because they are a hands on approach to art. 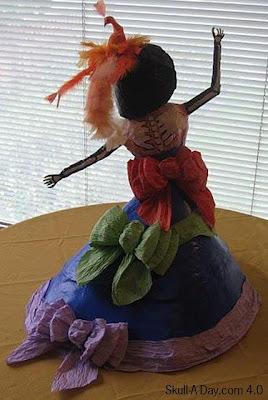 With clay, you have to use your hands to mold the medium to your desired form. 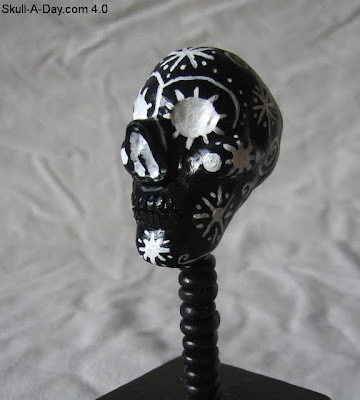 This clay interpretation of a traditional sugar skull is neat to see, since sugar skulls are one of my favor parts of Day of the Dead. 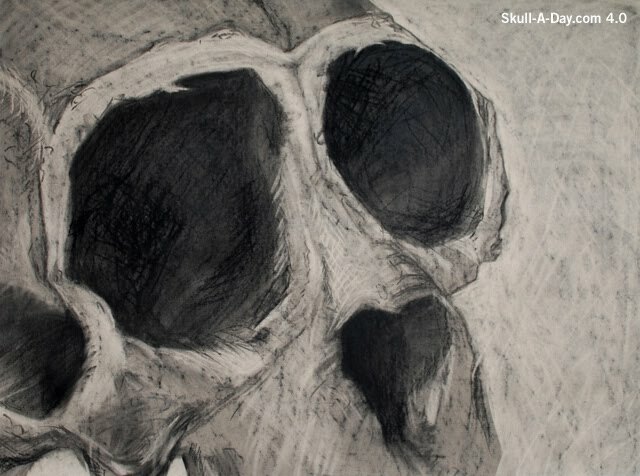 The charcoal drawings of the monkey skull are fascinating. Primates are my favorite animals...well next to Giraffes...because they are very similar to humans. Here you can clearly see the differences that a monkey skull has to a human skull. 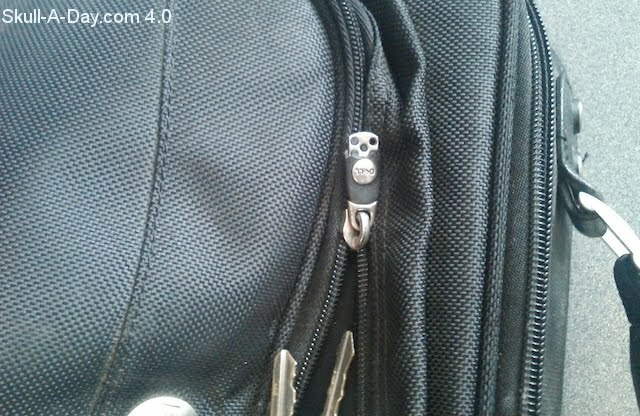 The head looks more elongated and with more crevices and shaping. I love the use of shading to show off these details. I have a replica of a human skull that I use for many Skull-A-Day projects, so I like seeing how someone else makes art using a physical skull for reference. All of these are wonderful. Keep making more beautiful art! 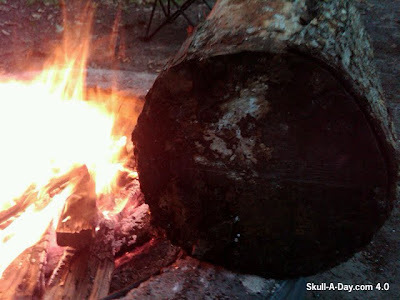 Sunday means it's time for more submissions from our faithful clan of skull hunters. Greg in Dekalb, Il was enjoying a campfire with friends when a buddy said, "Take a closer look at this, doesn't it look like a skull?" He immediately thought of our site. 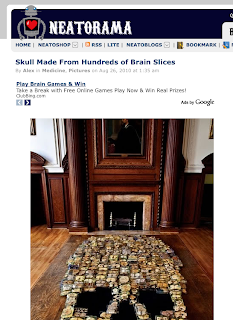 The powers that be are generous in the multitudes of skulls that are being caught by our hunters. Thanks to all of the keen hunters out there who are quick with a camera and an emaill address to submit to us. Thanks for keeping the hunt ALIVE! Ramon Rodrigues is a Brazilian industrial designer and graphic artist who currently finds himself in Buenos Aires, Argentina. His skull mask painting has found it's way to America for proper display here on Skull-A-Day. This painting was done in china ink with water on paper. The original size is 65 x 35 cm. You've done a wonderful job of crafting a lovely work of art as well as creating a perplexing story. 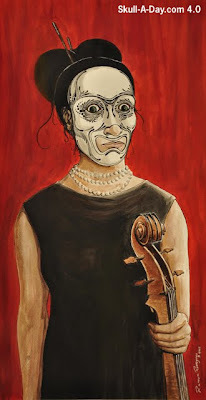 Is the musician so admired that she needs to disguise hgerself while on stage so that no one knows her true identity, or is she ashamed of some unknown physical defect that makes her choose to show her skull rather than the face upon it? It's a great piece to ponder, Ramon. Thanks for sharing it. Today’s flashback comes from very early in the project. This is one however that I feel is often overlooked, perhaps it is because it was too early in the year or maybe the material is just too mundane to invoke any passion. I however, find this piece not only brilliantly thought out, but extremely well executed. 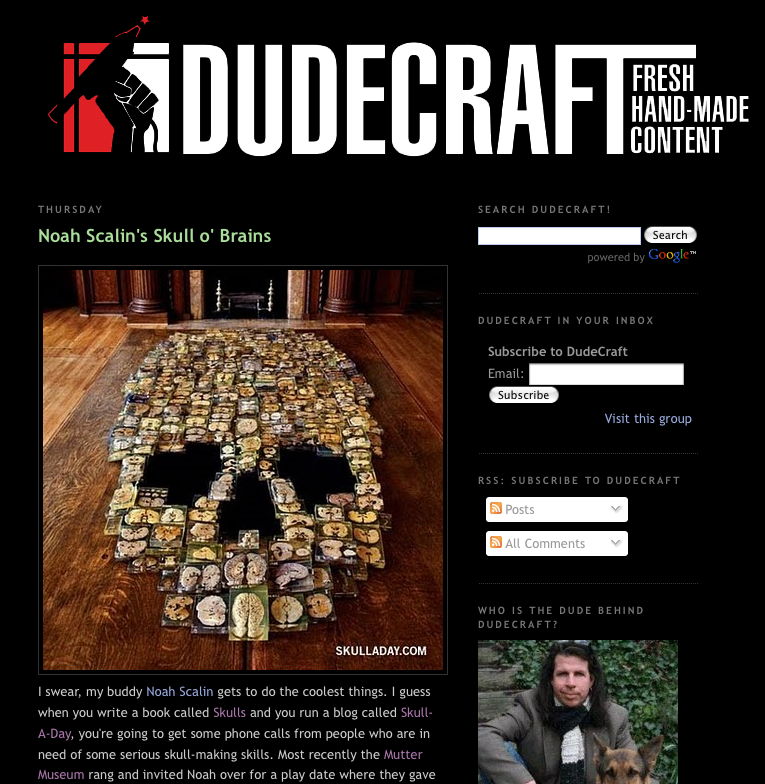 In this piece, Noah crossed the threshold of getting into more traditional sculpture. Before this point, all of the pieces had either been cut or arranged, and the 3-D work he did was building upon what was already there. This piece was Noah's first attempt at a 3-D skull “ex nihilo” for the project, and because of that this piece is one that comes to mind quickly when I think about the great art that was produced during the original Skull-A-Day. Next week, we move into my Top 5, anyone have any guess of what they may be? In addition to the recent brain slice skull I made at the Mütter Museum they also had me answer some fun questions on the blog for their fantastic store! 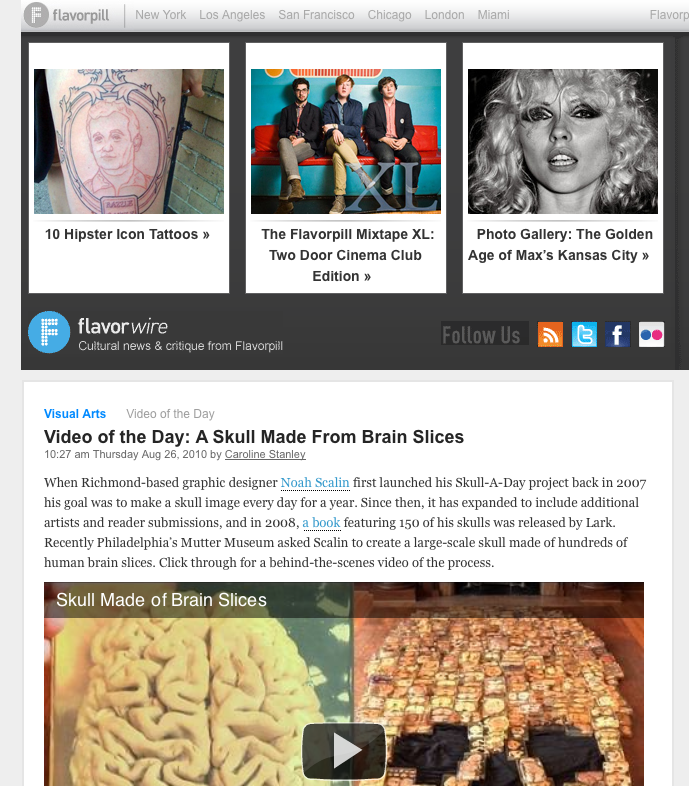 Flavorpill Video of The Day! This week, I went to Myrtle Beach, SC with my husband and daughter, for our wedding anniversary. On Tuesday, we went to the beach. Before going to play in the water, I was determined to make a skull out of shells. With help from my daughter, we gathered a variety of shell pieces. 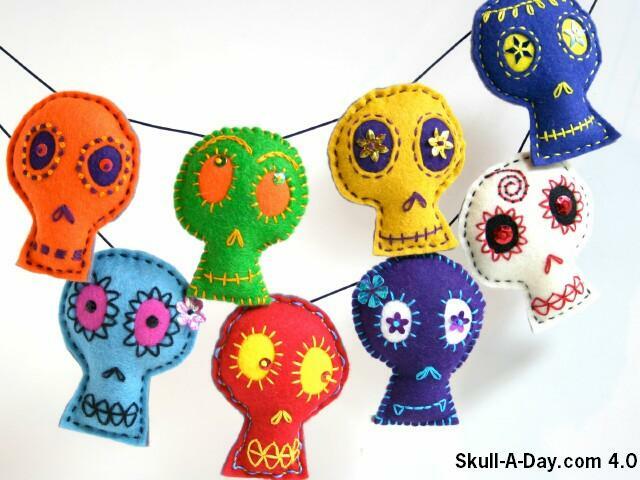 I arranged them into a skull shape. It's sort of like a puzzle. 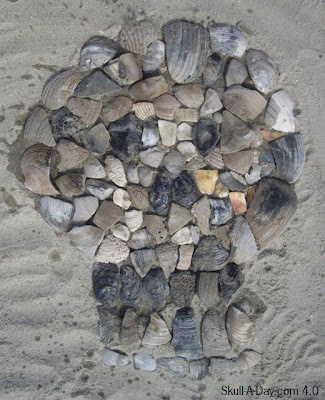 I had to look at the shapes of the shells to decide placement. 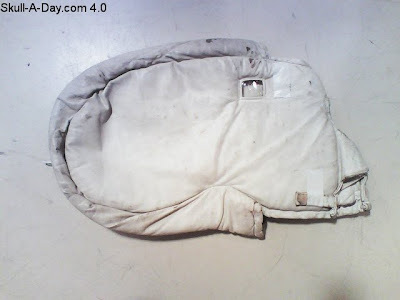 The largest ones with curved edges formed the curve of the head. The large "tooth like" ones, were used for teeth. The rest were used to fill in. My husband thought that I needed to make the shells look darker by using water to wet them. Alex (our daughter) accidentally left her sand toys at home, so with many handfuls of water (I'm sure I looked odd cupping my hands, filling them with water and then pouring the water onto a skull shaped with shells), this was achieved. I of course left the intact for others to see. 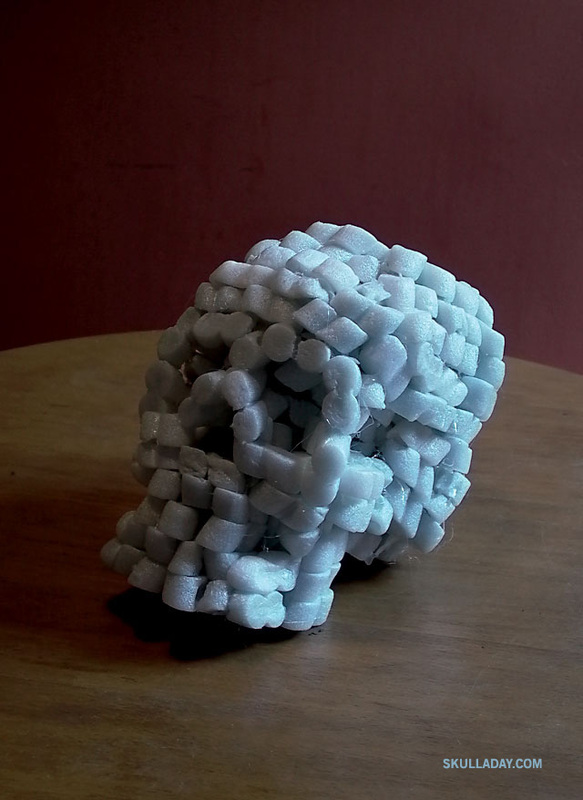 There is no tutorial for this one, because it's an arranged skull. With some time and effort, you can use anything to make an arranged skull. 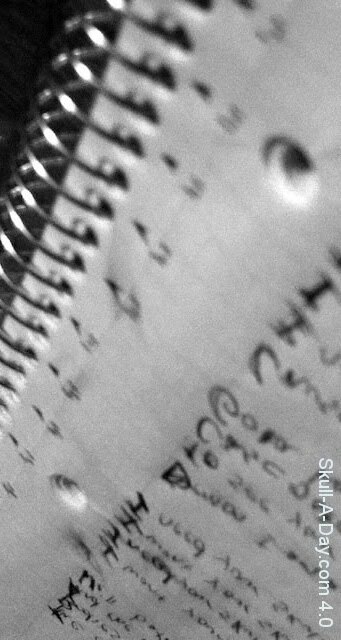 Just use your imagination. I saw this piece from Yuki Snow in our submission and knew it would be perfect for today. Here's Yuki Snow's explanation of herself: "I am Japanese Artist/ Art lecturer, living and working in the UK. I have been exhibiting professionally as an Artist for the last 10 years at contemporary art galleries in the UK, New York, Brazil, Greece and Japan and was recently selected and published as one of the 36 featured Japanese Artists in a Taiwanese Art catalogue. My textured paintings combine knitting, embroidery, sequins, buttons, acrylic and oil painting as the sensation of touch is very important in my artwork. This image was made in 2006 out of embroidery and acrylic stencil on canvas." Since I was a little girl (about 4-5), I've been doing embroidery. 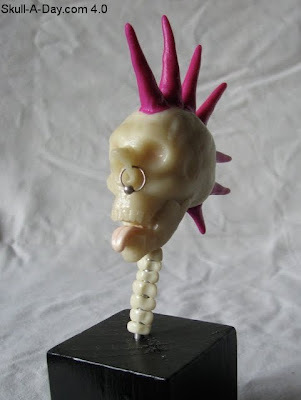 When I see awesome pieces like this, I'm instantly drawn to them. My best friend Kit McSmash, (Partner in Crime...or Craft) of over 20 years, is a fiber artist and currently in Japan on a much deserved vacation, so this particular one made me think of her. Up until a couple years ago, she had the front of her hair pink for many years. 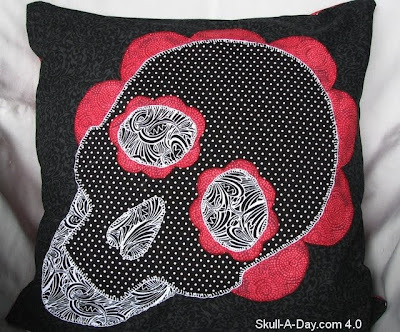 She is like my sister from different parents, so of course we love similar things, like creepy skulls. One day, we will make one together. 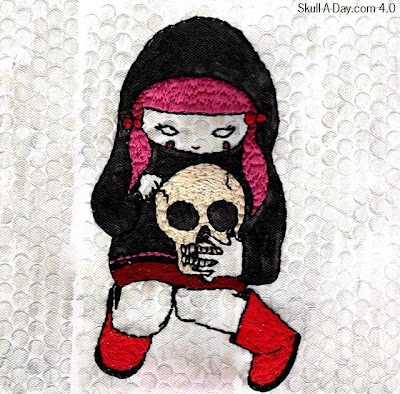 For this piece, I love the use of a filling stitch for the hair, skull and boot areas. 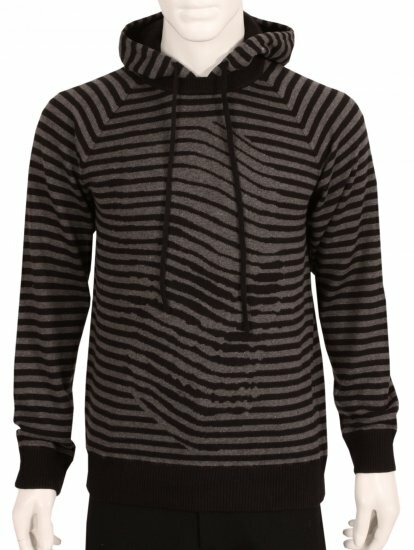 I like being able the see the texture of the fabric through the skin areas and black of the hoodie. I love seeing embroidery still used to create wonderful art. There are other great pieces on Yuki Snow's website, that use similar techniques that create amazing results, so I suggest checking out her other pieces too. As always I had a wonderful time with the staff of the museum and can't wait to get back there to do something else! 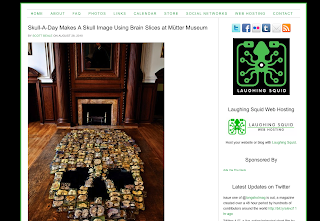 While the piece itself was only temporary and dismantled shortly there are still tons of great stuff to see in the museum (including a few of the original Skull-A-Day pieces on display right next to the gift shop). I highly recommend you visit the Mütter Museum you're ever in Philadelphia, you won't be disappointed. I really like the different skull sculptures (skullptures) that you do. 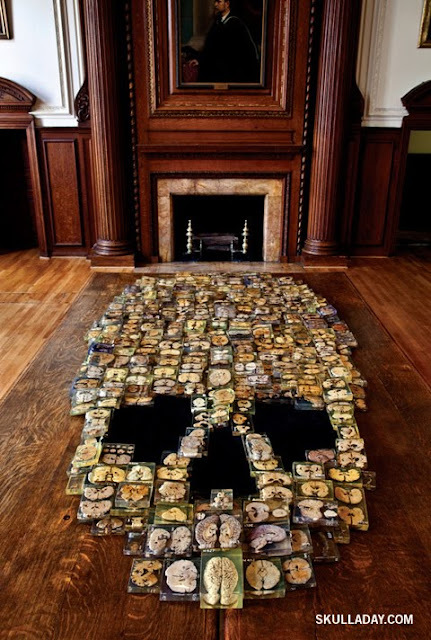 I can envision a possible series of skulls of famous people through history with matching bases. I also appreciate the amount of work that goes into your soft sculptures, it takes technical proficiency to make them turn out as successfully as they do. 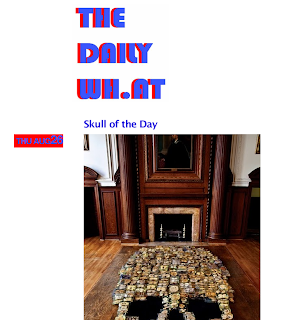 Thank you for submitting your work to us, and make sure you thank your friend for sharing Skull-A-Day with you. 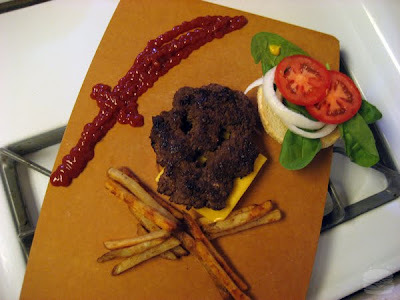 You definitely should be following his progress on his Everything Burger site or on the project's Facebook fan page! 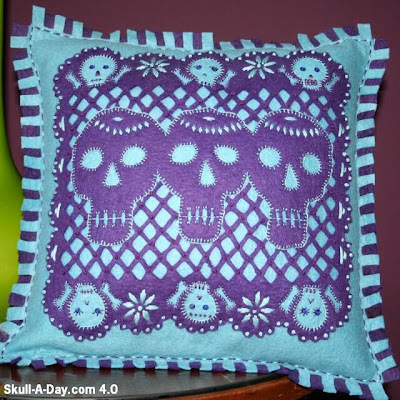 Are you making a daily project inspired by Skull-A-Day? Let us know! First up is based on an amazing German art project called Blinkenlights where a real building was turned into a giant digital display! 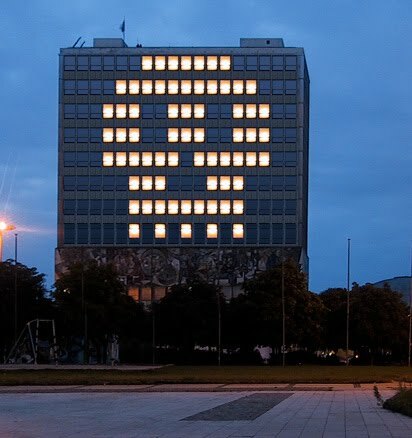 Even though the project is over, you can still get a taste of it with their Blinkenpaint program, which allows you to make images by virtually turning on and off lights in a photo of the building. I hope you'll give them a try and hey, if you find some other great free online image-making tool and you create a skull with it, send us the results! The fine folks at Sibling London have released a lovely knit hoodie using my Skulladelic image! There are only a limited number available, which can be purchased online HERE. The original breton they made using this design is still for sale in their shop as well HERE and HERE. Nemo is an artist touring the usa in a van. He sent us a photo of a skull that he drew on his jeans and a day of the dead girl. 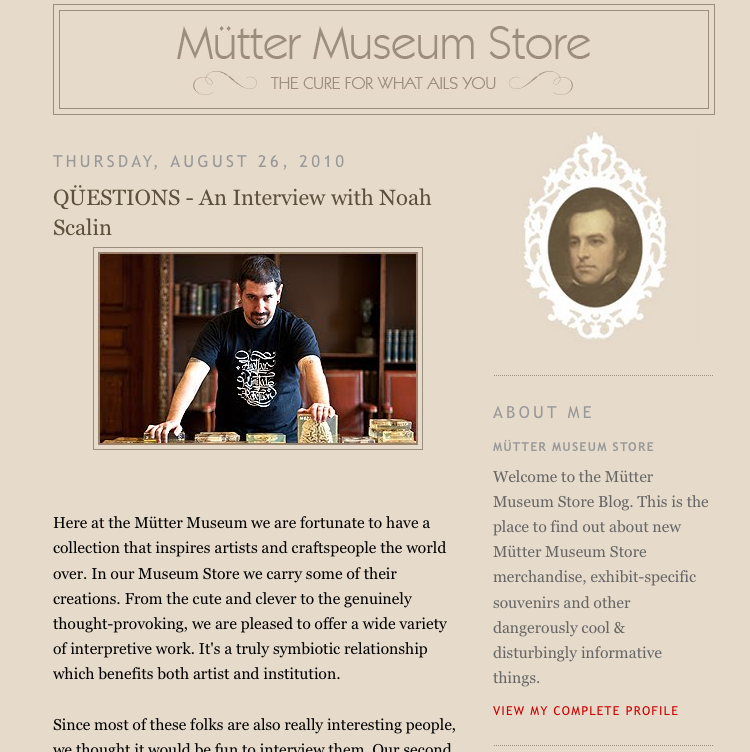 You can find more of his artwork on his blog and website. I love the use of the concentric circles to form parts of the images. With the girl, the curves of the radiating circles (like ripples in water), form the tendrils of her hair. The chest has stacked half circles that reminds me of scales. It is really nice to see the shading that is formed when the design is compacted smaller at the underside of the chin. I like the graphic quality formed by using black, white and gray with pops of red. The heart is a simplified Sacred heart and is positioned where a regular heart would be. 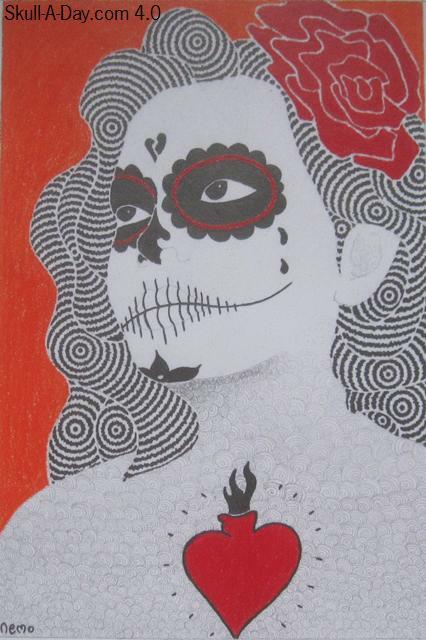 You all already know the deeper personal meaning hearts have for me and it is the same with this piece. If you look closely, there are faint lines of lips under the lines for the teeth, or stitching. 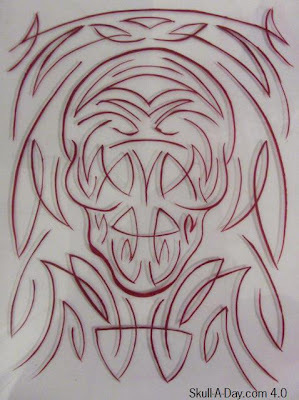 In combination with the broken heart on her forehead (broken mind?, stitched mouth, sacred heart and tears, this piece could be thought to be about the pain of love that we all endure at one point in our lives. We all hope it doesn't kill us. The 2nd piece is drawn on a pair of jeans. It is far more intricate and nice than anything I ever painted on my jeans. 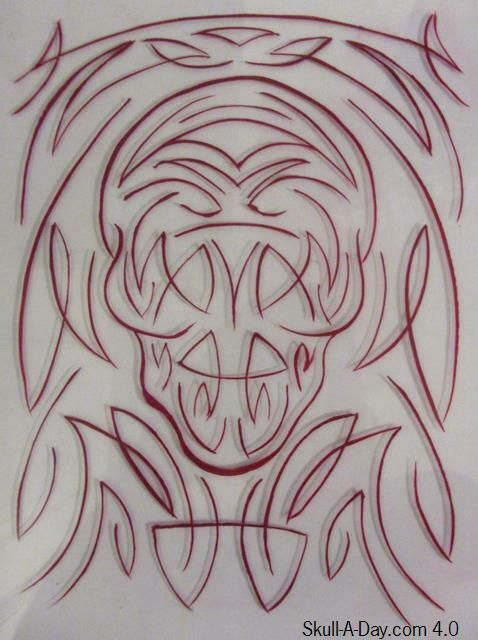 Similar to the tendrils of the girl's hair, the use of the circles help form the shape of the face, give it dimension. They also are used in both flowers, showing the lines of petals. The larger concentric circle on the forehead also plays with my eyes, causing lines to radiate from the center, forming gray triangles. Of course, that is just an optical illusion. These are both excellent pieces and makes me want to make a better doodle than the similar ones I've done before. 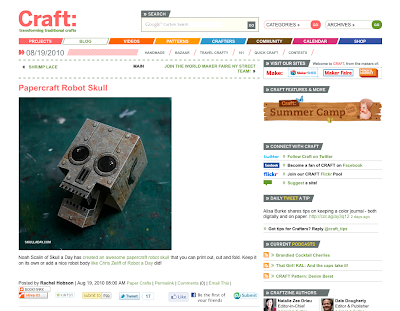 Craft gave a nice shout out to my Robot Skull Papercraft! 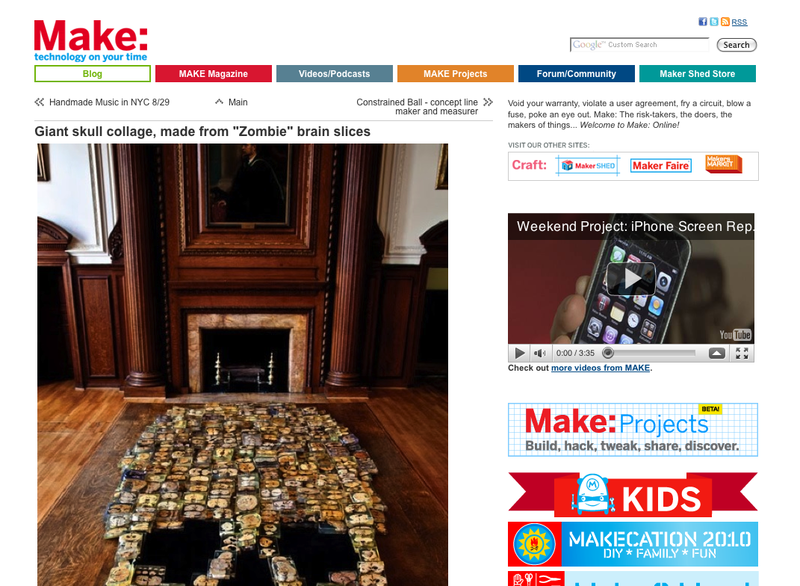 Have you made one yet? Why not send in a picture! Today’s Simulacra come to us in their natural state. We encounter these objects in our everyday lives paying no attention to them until one day the light is different or the item is at a different angle from the way we usually see it and suddenly a simulacra appears that has been there all along. Keep looking out for those simulacra that are just yearning to be discovered and thank you all for this week’s collection of discovered simulacra. 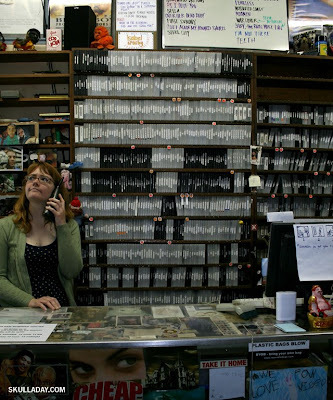 Just recently my local video store closed down and there were huge walls with only a few movies. If the employees hadn’t been so disgruntled I would have attempted to do something like this in solidarity with those who were about to lose their jobs. It was sad to see that this chain store who chased out the independents a few years ago now were being chased away by the internet leaving nothing in the community. 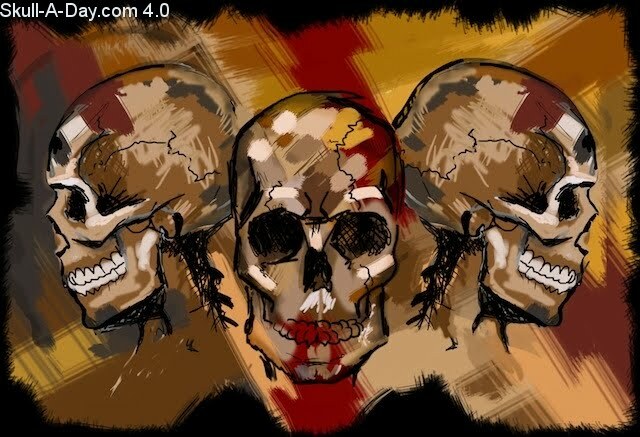 This piece however, is a great example of how Skull-A-Day shifted that year. 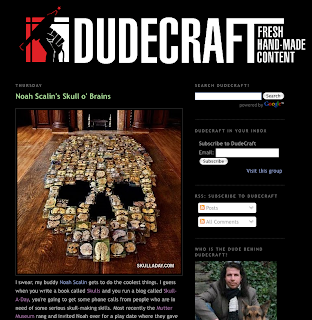 At first it all rested on Noah to finish the project, but as it grew that year, by the end it became much of a community effort to see this project succeed. Noah still did all the skulls, but there was this cheer-leading effect that seemed to emerge and much of the second half included skulls that came about because of others’ involvement. I guess one could say that what you need in order to have a successful 365 project is the support of friends that will inspire and teach you when your bucket list is empty. Tiffany Berkovitz sent this in on behalf of her son Jacob who saw her earlier post here and was inspired to create his own skull for us. 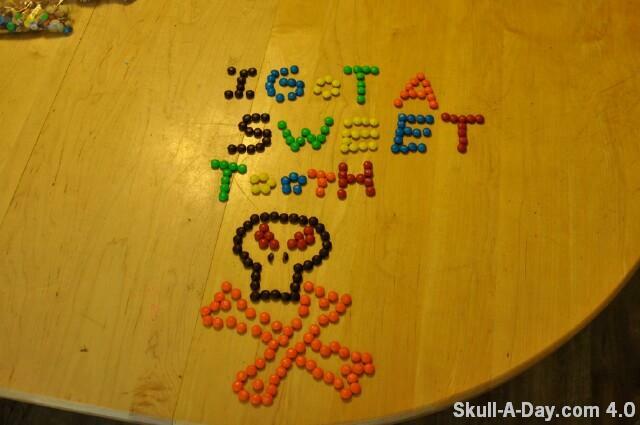 It looks as if your skull may have lost all of its teeth, maybe due to its sweetness. 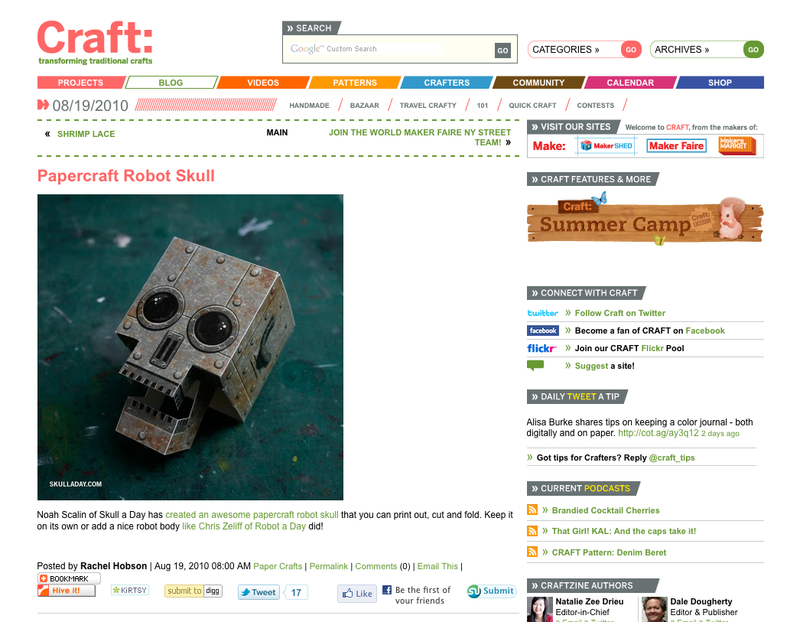 We are always happy to learn that someone was inspired by the site enough to go out and create art. Being that this art is both delicious and temporary makes it only that much sweeter. Thank you for sharing your work with us, and congratulations on joining the ranks of other great candy skulls of the past. 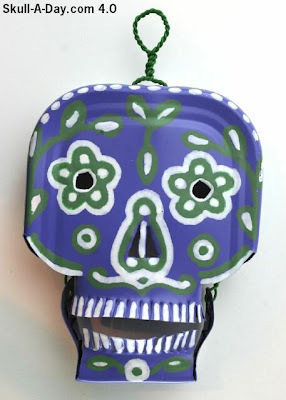 With Dia de los Muertos quickly approaching (72 days until), I was inspired to make a colorful skull. I love mixing flowers with skulls. 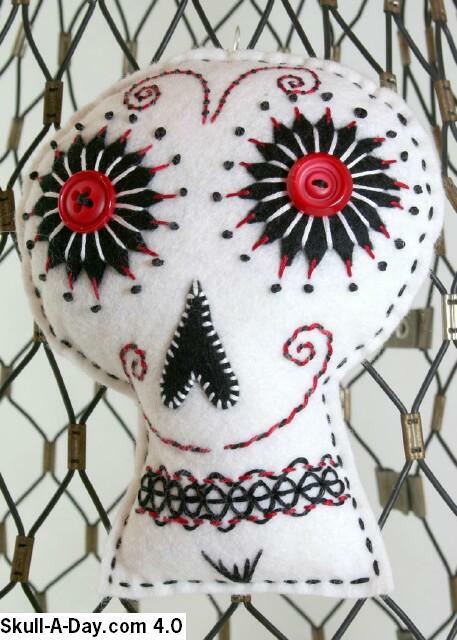 It's reminiscent of Dia de los Muertos folk art as well as a representation of life and death. It's also very funereal. Flowers are still used to adorn caskets and graves. 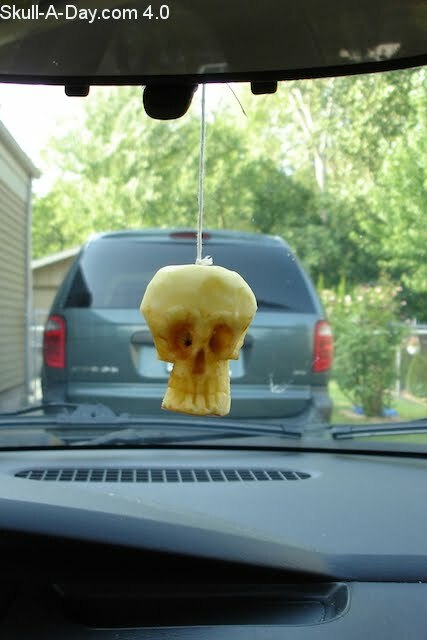 Once a need to cover the scent of death, they now are just a decoration. For me, flowers remind me of the beauty of life which helps in trying to celebrate the life of the deceased. 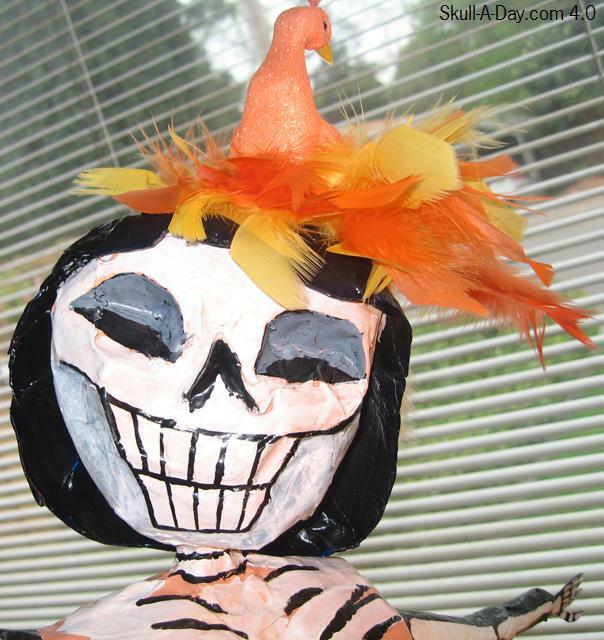 Dia de los Muertos is a yearly 3 day festival that celebrates the lives of the deceased. You have to remember the past to appreciate what you have in life. 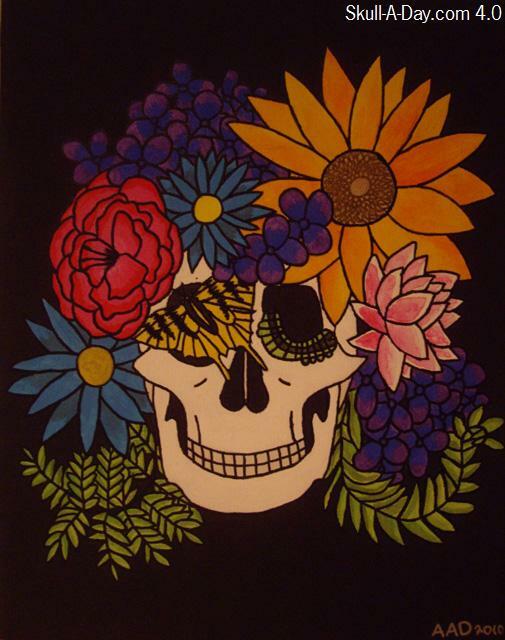 I used colorful acrylic paint and a black paint pen to make this piece. Oh and my trusty anatomical skull, as well as many beautiful flower photos for reference. In all of my other skull paintings I've only used black paint pen on a white canvas (except 1, I used crayon to color it in on the white canvas), so this piece is very different. I haven't painted like this in many years, so I definitely wanted to experiment with techniques, so I would find one that achieved my desired look. To find out what I did, see the tutorial. For those of you who are curious about what plants and creatures I used, they are blue daisies, blue purple hydrangeas, a sunflower, a lotus, a red pink carnation, 2 different ferns, a male yellow tiger swallow tail and it's caterpillar. The creatures are my favorite type of butterfly. I have the female tattooed above my heart, which I've mentioned before is a reminder of the delicacy of life. Rona Green from Melbourne, Australia sent us this linocut and etching entitled "Sergey". I recently adopted a kitten who likes to play rough, so this kitty caught my attention immediately. This kitty looks like he is up to no good. Looks like you can expect some piracy, fancy hats, pipe smoking, country music, candle lit dinners, an aversion to Black Widows, long walks on the beach at sunset and it looks like he has no commitment issues. Wait, with the exception on piracy (maybe he is just really good at protecting people), he seems like the perfect man. Wait, he's a cat...drat. Well, you take what you can get. I wonder if he likes cleaning. 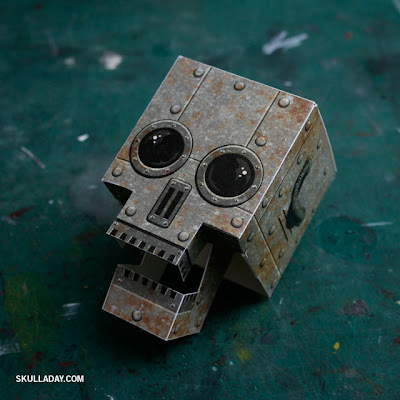 Inspired by a friend of mine who asked me to make a piece of robot art for her I decided to update my Papercraft Skull with a new robot skin! 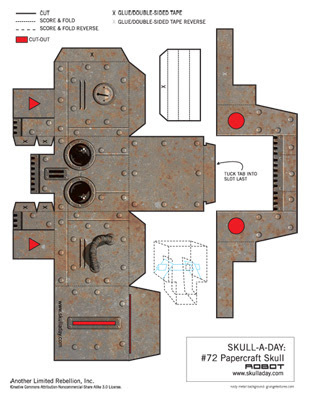 As always I've provided a free downloadable PDF so you can make your own! And hey, if you feel like making a custom design you can also download a blank version of the pattern as well. Of course if you make something new please send me a picture or two so I can share with everyone here! Tom Adams, who brought us the “Skelebike”, returns with a not so permanent skull. Tom wrote: “My daughter left this half finished apple sitting on the table today and I couldnt help notice how much it looked like a skull. So not wanting to waste an apple and a perfect opportunity I carved this little beauty and decided to dry it in the hot car. 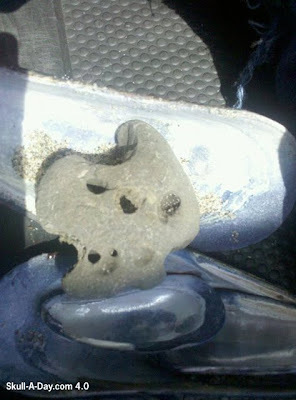 So here is the ‘Day One’ photo.” We learned from Tom that day that putting an apple in a hot car was a bad idea. 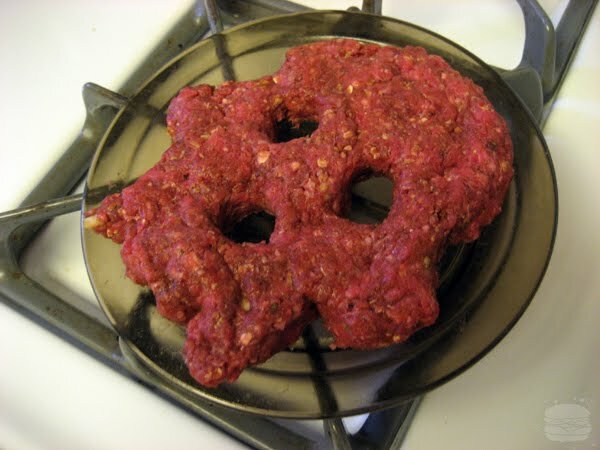 Even though this piece only lasted a few hours it was a great success while you had it. Let me encourage you to continue this persuit with some info that I uncovered here. 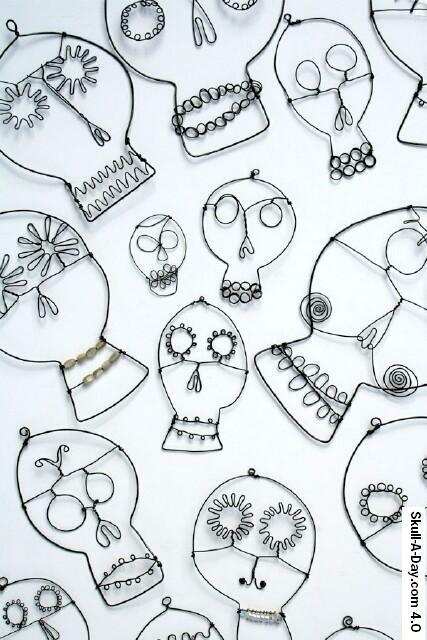 Thank you for sharing this with us, and remember a Skull-A-Day keeps the boredom away. Micah Vogel from Omaha, NE sent us this piece. 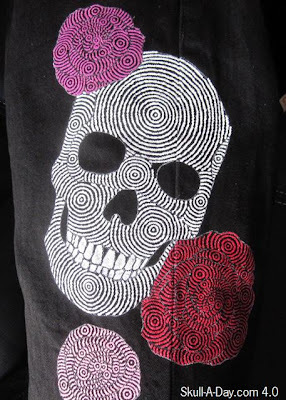 "I've started to teach myself to pinstripe, and here is a skull designs I came up with and painted." Pontiac Firebird (should the "Firebird" not be there) or the side panels of a '57 Chevy Impala...which are my dream cars. 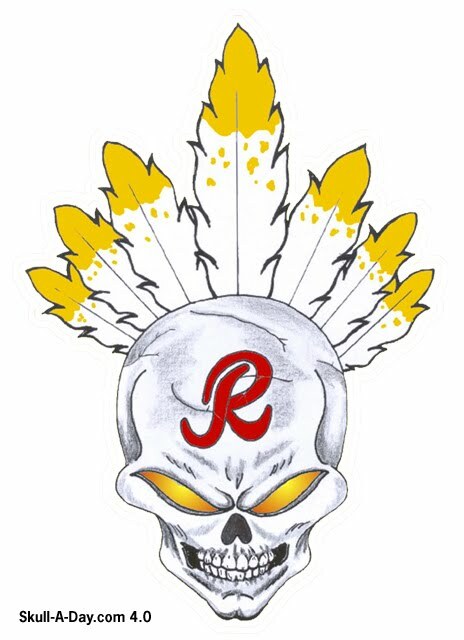 I can imagine that any care that would be adorned with this pinstriping would of course, need skull print upholstery and a skull dangling in the rear view mirror. Maybe one day, I will have a car like this, but for now, I can only dream. Daniel Nicholas made this pretty girl for a friends birthday. He said, "she turned out so good I almost kept her for myself." I really love this saucy skeleton senorita. 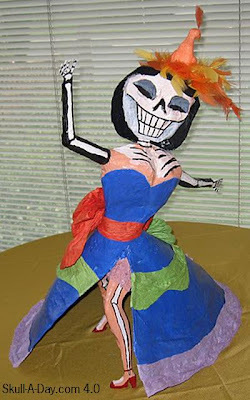 She is definitely enjoying her dance with dead. The details are what really makes this doll sensational. The orange fascinator with orange bird is something I might actually wear, but in black...you know, to be subtle...yeah. The dress is beautiful with it's tiers, bows and very sultry front slit. The skeleton is beautiful and curvy. I like the use of flesh tones mixed with the bones. It makes you unsure if she is really dead or just playing dead. She is a fantastic doll. I can see why you almost kept her.